Taiwania has an unusual disjunct distribution with the main populations along the border between Yunnan and Myanmar (Gaoligong Mountains) and on Taiwan. There is also a small population in Việt Nam. Historical logging has reduced and fragmented the global population; forest conversion and fires threaten the Vietnamese locality. Taiwania has an unusual disjunct distribution split between the Chinese/Myanmar border, Việt Nam and Taiwan. In the western part of its range the main populations occur in the northern Gaoligong mountains north of Gongshan, Yunnan. It also occurs in adjoining parts of Myanmar. Remnant populations occur in the southern part of the Gaoligong but these have been intensively exploited over the last 100 years and few trees remain. A single locality in Lao Cai province in Việt Nam was discovered in 2001 during botanical surveys associated with gibbon conservation work. Fewer than 100 mature trees remain; it's likely that this was part of a larger population that has been reduced as new settlers cleared the formerly pristine forest. In Taiwan it is mainly located in the central mountains where it occurs in scattered stands. In 2001 a new population with an estimated 10,000 mature trees was located in the very remote and inaccessible valley in south east Taiwan. 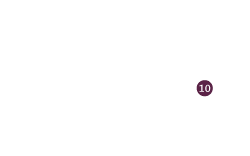 Range wide phylogeographic studies indicate that the main populations are significantly genetically different from each other and that the Taiwanese subpopulations have been isolated for several million years. Reports of Taiwania from Guizhou, Guangxi, Sichiuan and Fujian probably represent cultivated or naturalised trees. 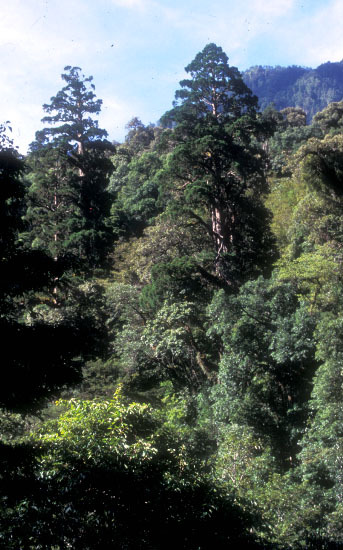 In these areas, the altitudinal range and annual rainfall are much lower and the associated species (Pines and Cunninghamia lanceolata) are generally indicative of secondary forests. Taiwania is a large emergent tree that can reach heights of up to 50m. Estimated ages, based on ring counts are as much as 1872 years (He et al 2015). Its altitudinal distribution ranges from 1750-2900 metres above sea-level; records from higher elevations are historic and the main extant populations occur below 2500 metres. Regeneration is episodic and, at least in Taiwan and in the Gaoligong Mountains probably related to landslips caused by earthquakes. In the western part of its range it occurs with Tsuga dumosa and a rich variety of angiosperms in mid montane evergreen forests. Rainfall in this area may exceed 4000mm per year and trees are usually covered with Usnea longissima. Other conifers such as Taxus wallichiana and Torreya grandis var yunnanensis occur in the understorey. A detailed account of the vegetation associated with Taiwania in the northern Gaoligong Shan is given in He et al (2015). In Việt Nam, Taiwania is associated with Fokienia hodginsii. The evergreen forest is dominated by Fagaceae, Lauraceae and some Magnoliaceae. Rainfall is lower than in the Gaoligong but may still exceed 2500mm per year. In Taiwan most stands occur in the relatively cool montane forests where a rich variety of other conifers such as Chamaecyparis obtusa var. formosana and C. formosensis, Calocedrus formosana, Cunninghamia konishii, Picea morrisonicola, Pseudotsuga sinensis and Tsuga chinensis also occur. Angiosperms include Castanopsis, Quercus and Trochodendron aralioides, Camellia brevistyla, Eurya, Rhododendron, and Vaccinium. The bamboo Yushania niitakayamensis may dominate the understorey. Taiwania has a long history of exploitation for its durable, fragrant timber; one of its principal uses was for coffins. In Việt Nam it was locally used for house construction. Chemicals with insecticidal and medicinal properties have been extracted from the wood. The current IUCN status is based on an estimated recent and historic decline in the major areas of its distribution along the Chinese/Myanmar border and in Taiwan of between 30 and 49%. As early as the 1930s, British foresters and botanists were reporting its growing rarity in the southern Gaoligong Mountains due to an intense demand for its timber, often used for coffins. The remaining subpopulations have become severely fragmented. Direct exploitation is now limited as most stands occur within protected areas and logging bans are in place in China and Taiwan. Logging is still occurring in Myanmar and the Vietnamese stand is threatened by fire. The most recent official national assessment (Wang & Xie 2004) lists this species as Vulnerable under the A1 criteria, implying a decline of more than 50% within the last 3 generations. It also imples that the causes of the decline have ceased, are understood and are reversible. While the first two conditions have ben met, the conversion of large areas for agriculture and other uses, combined with the fragmented nature of the remaining habitat make those changes irreversible within the forseeable future. Consequently, an assessment of Endangered under the A2 criteria would be more consistent with the IUCN guidelines. Large scale exploitation in the southern part of its range during the early 20th century, combined with ongoing logging in other parts of its range makes an estimate of at least a 50% reduction reasonable. Further field research is needed to determine the extent of the remaining stands. In Taiwan, exploitation of this species stopped in the 1980s. The remaining stands are fragmented and isolated: regeneration is very poor and decline is ongoing. Historic decline is estimated to have been more than 50% leading to a national assessment of Endangered under A2. The Vietnamese stands have an area of occupancy of less than 10km. There is a single location and the quality of habitat has undergone a recent decline due to logging and fires associated with shifting cultivation. Although several conservation intiaitives are underway, these have only started in the last 10 years and need at least another 10-25 years to stabilise and improve the situation. The majority of stands are now within national parks such as the Yushan National Park in Taiwan (established 1984) and the Gaoligong Mountains National Park in Yunnan (established 1996). Logging bans have been introduced in mainland China and Taiwan. In Việt Nam community led conservation programmes have been initiated to restore the reamining forests. The Van Ban area where it occurs was declared a provincial Nature Reserve in 2007. In both China and Vietnam seed collections for ex-situ storage and to support restoration work have been undertaken. Seed orchards have also been established in Taiwan. Chou, Y.W., Thomas, P., Ge, X.J., Le Page, B. & Wang, C.W. (2011). Refugia and phylogeography of Taiwania in East Asia. Journal of Biogeography: 38:(10) 1365-2699. Farjon, A. & Thomas, P. (2007). Taiwania cryptomerioides - an overview biogeography and conservation. The International Symposium on Taiwania cryptomerioides, 8-10 December 2007, Nantou County, Taiwan. Taiwan: Experimental Forest, College of Bio-resources and Agriculture, National Taiwan University. : 9-17. Global Witness. (2005). A Choice for China Ending the destruction of Burma’s northern frontier forests. A Briefing Document by Global Witness. October 2005. Global Witness Ltd., London. Global Witness. (2009). A disharmonius trade: China and the continued destruction of Burma’s northern frontier forests. A Review by Global Witness: 2006-09. Global Witness Ltd., London. Hoang Van Lam & Yen Hoang Mai (2013). Hoang Lien- Van Ban Nature Reserve In: Sunderland, T.C.H., Sayer, J. & Hoang, M.H. (eds) Evidence based conservation: lessons from the Lower Mekong. Routledge, Oxon. pp 61-70. Kermode, C.W.D. 1939. A note on the occurence of Taiwania cryptomeriodes in Burma and its utilisation for coffin boards in China. Indian Forester 65:204-206. Nguyen, T.H., Do, T.D. & Phan, K.L. (2002). The diversity of the flora of Vietnam 9. Taiwania Hayata and T. cryptomerioides Hayata (Taxodiaceae): new genus and species for the flora. (in Vietnamese with English summary). Journal of Genetics & Applications 1: 32-40. Nguyen, T.H., Phan, K.L., Nguyen, D.T.L.,Thomas, P.I., Farjon, A.,Averyanov, L. & Regalado Jr., J. (2004). Vietnam Conifers: Conservation Status Review 2004. Fauna & Flora International, Vietnam, Hanoi. Wang, C.N. (2002). 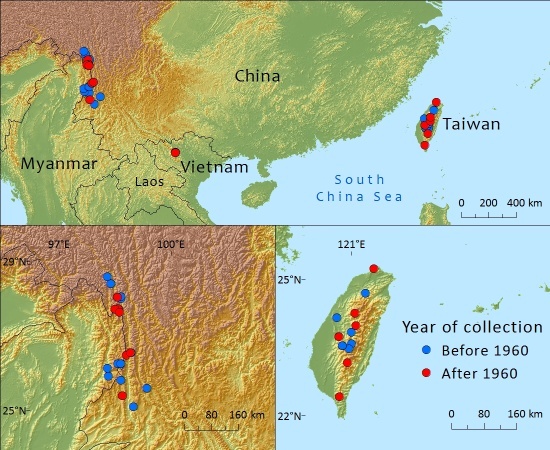 Extensions to the natural range of Taiwania cryptomerioides: largest known population discovered. Fitzroya 5: 5. He, L.Y., C.Q. Tang, Z.L. Wu, H.C. Wang, M. Ohsawa & K. Yan (2015). Forest structure and regeneration of the Tertiary relict Taiwania cryptomerioides in the Gaoligong Mountains, Yunnan, southwestern China. Phytocoenologia 45(1-2):135-156. P.Thomas,Chun-Neng Wang,and Rong Li, 2015. Taiwania cryptomerioides, from the website, Threatened Conifers of The World (http://threatenedconifers.rbge.org.uk/taxa/details/954).